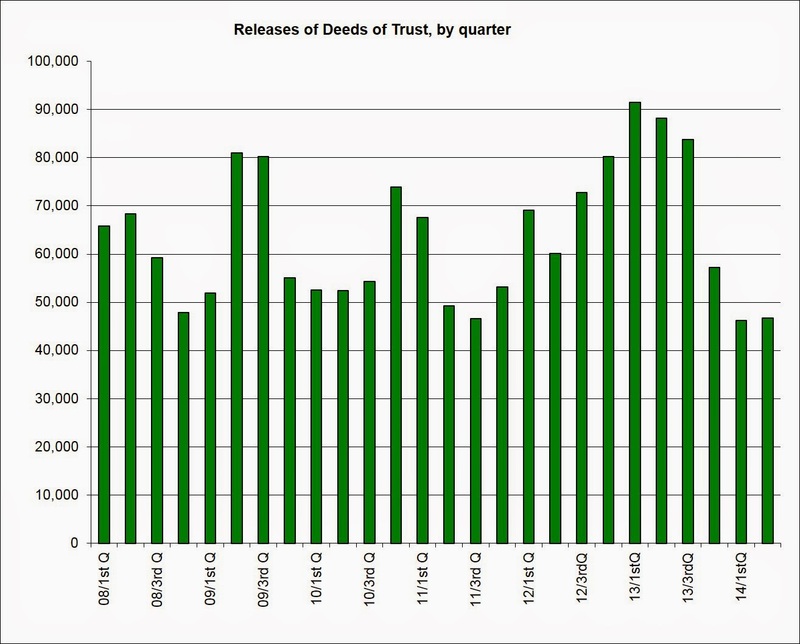 Releases of deeds of trust during the first half of 2014 were down significantly in Colorado metros compared to 2013 during the same period, and were flat from the first quarter of 2014 to the second quarter. 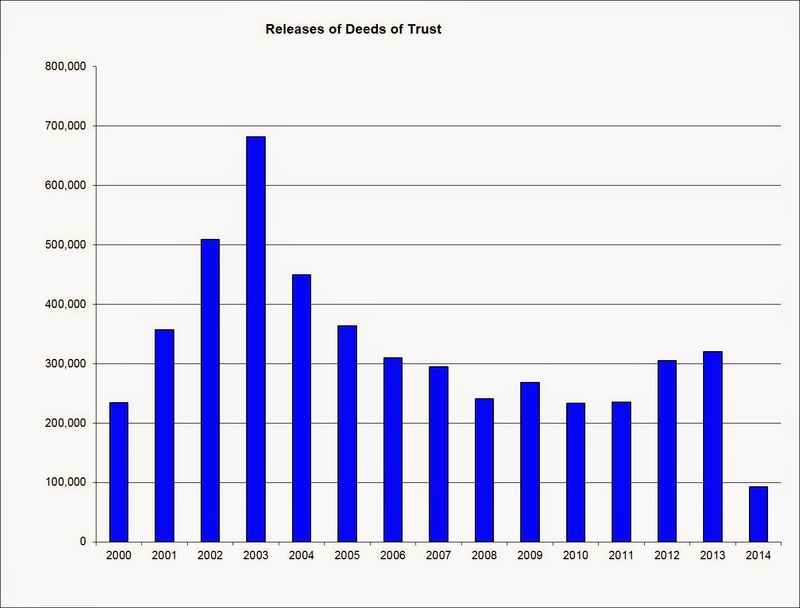 During the first half of 2013, there were 179,747 releases of deeds of trust in Colorado metros, and during the same period of 2014, there were 92,955 releases, for a year-over-year decline of 49.4 percent. A release of a deed of trust is an event that occurs when a deed of trust (often referred to as a mortgage) is paid off, either through refinance, sale, or when all payments have been completed on a home loan. It is a "positive" economic indicator in sense that areas with improving economies tend to generally also report increases in releases of deeds of trust. For the second quarter alone, across Colorado's metropolitan counties, 46,696 deeds of trust were released. That's a 0.9 percent increase from the first quarter of 2014 when there were 46,259 releases. Compared year over year for the second quarter alone, releases were down 47.1 percent from the second quarter of 2013 when there were 88,217 releases. 2014's 2nd-Q releases were down 22.4 percent from the same period of 2012. The first graph shows the quarterly total for releases. We can see that totals were near the lowest level recorded since 2008, and were quite low for all of the first half of 2014. 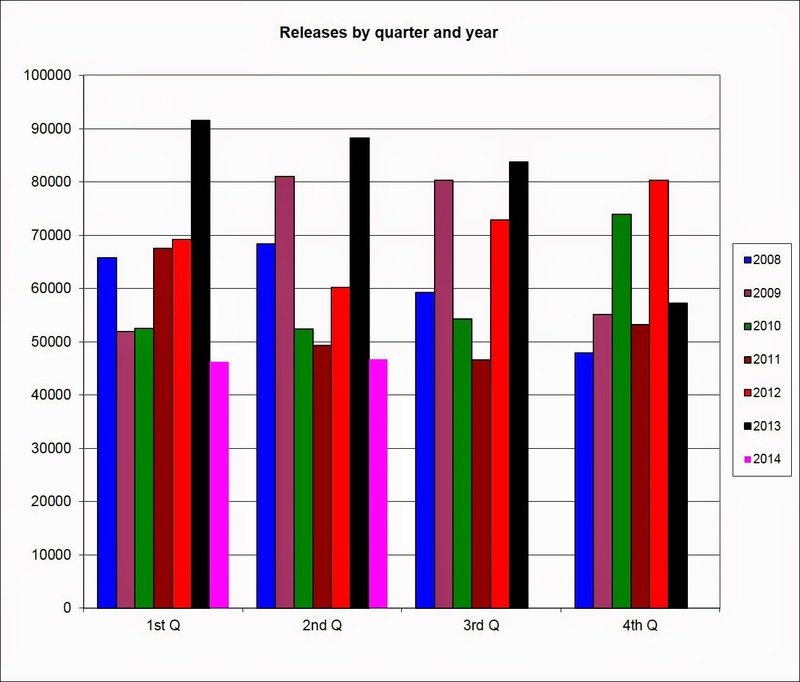 The second graph shows release totals compared against the same quarters for each year. Note that the second quarter of 2014 is the lowest quarterly total for releases recorded since 2008. The same was true of the first-quarter total. The low levels of release activity persisted in spite of the fact that mortgage rates continue at very low levels. Release activity is generally tied closely to movements in the mortgage rate, and refinances especially tend to increase as mortgage rates move down. However, in spite of low rates, releases have remained low, suggesting that the market for refinances has been largely exhausted. 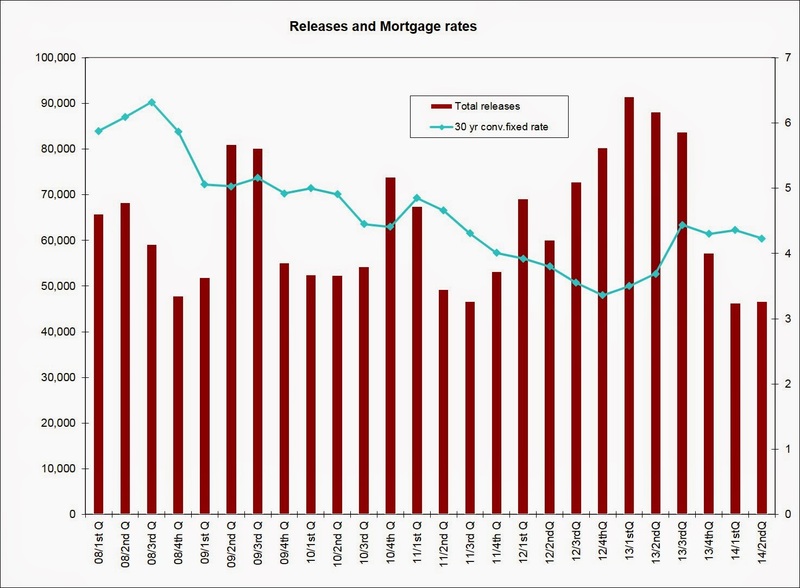 The third graph shows the relationship between the mortgage rate and release totals. While mortgage rates have increased from the extremely low levels seen during 2012 and 2013, rates still remain at historic lows under 4.5 percent. This, however, has failed to produce the sort of new loan activity seen during periods with rates that were 50 basis points higher, back in 2009. Looking at release activity on a county by county basis, we find some significant changes in trends. The first chart shows quarter over quarter changes in each county surveyed. Douglas County, which, as a high-income county, typically tends to outpace other counties, but in this case saw a large drop off over the period. The second chart shows year-over-year changes. 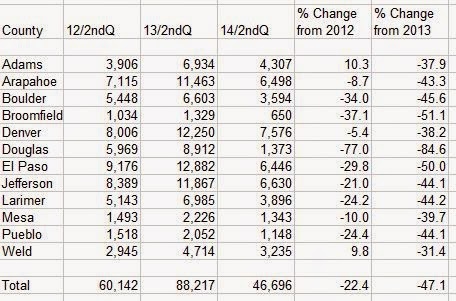 In this case we find more uniformity in that all counties reported declines, year over year for the second quarter. Weld County, not surprisingly reported the smallest decline, owing at least partially to large amounts of oil-driven economic activity in the region. The third chart shows year-over-year changes for the first half of each year. In this case, all counties reported declines year over year with the smallest declines coming from Weld and Denver counties. And finally, we can compare the counties more accurately by adjusting release activity for the total number of housing units in each county. In this case, we see the largest amount of release activity was in Weld, Larimer, and Jefferson counties, and the lowest amount was in Douglas County. It is unclear why Douglas County would show so little activity at this time, and it does suggest that some additional analysis is needed for the county in home sales and building permits and median home prices. Overall, these numbers point to a soft market for refinances, and to small number of new home sales, in spite of continued growth in median home prices in all areas.